Graduate school is an intense and specialized course of study. While an undergraduate education provides broad knowledge with some specialization in a major area, graduate school focuses exclusively on a specific area of study. There are many types of graduate degrees. Two common categories: master’s and doctoral degrees. Master’s Degrees involve 1–2 years of full-time work to complete. 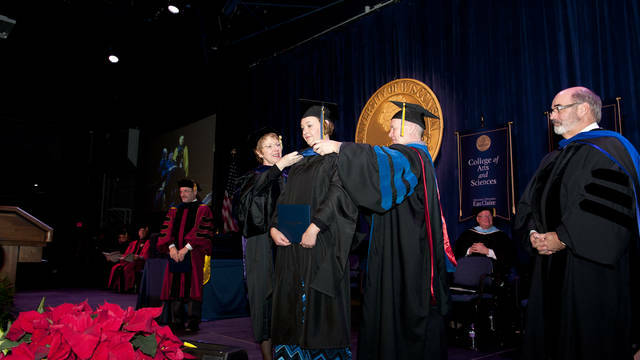 Typical degrees: Master of Arts, Master of Science, Master of Physical Therapy, Master of Social Work, Master of Public Health, and Master of Public Administration. Doctoral Degrees involve 4–6 full-time years to complete. Typical degrees: Doctor of Philosophy, Doctor of Education, Juris Doctor (law degree), Doctor of Veterinary Medicine, and Medical Doctor. Each degree may be granted from a variety of programs. For example, a student may receive a Master of Science in Microbiology or a Master of Science in Psychology. Some degrees can be completed on a part-time basis over an extended period of time. Graduate school is a large commitment in terms of time and money. Be sure to apply for the right reasons. 1 )A graduate degree is essential for going into certain professions. 2) A graduate degree impacts career advancement. 3) A graduate degree can give the personal satisfaction derived from advanced learning. When making decisions about graduate school, talk to a faculty advisor and/or use Career Services resources including meeting with a Career Counselor, investigating Blugold Success Stories and talking to some Alumni who have completed graduate school. Find tips and resources here to best find and evaluate the graduate programs where you might want to apply.